Maybe not the one you’re working on today. Maybe not the one you’re starting next month. Heck, maybe not the one you don’t even know about yet…but at some point in the future – if you stay in the data world long enough – your data project is going to fail. There are may ways your data project could fail. Martin Goodson shares his thoughts on Ten Ways your project could fail, and I’ve seen failure’s driven by each of Martin’s “ten ways” during my career. 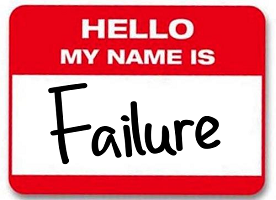 The most spectacular failures have come from the lack of clear strategy for any data projects. It should be common sense in the business world that if you don’t have a strategy and plan to execute that strategy in place, you are going to have a hard time. When I use the word ‘strategy’, I don’t just mean some over-arching plan that somebody has written up because they think ‘data is the new oil‘ and by ‘doing’ data projects they’ll somehow magically make the business bigger / better / richer / strong /etc. Data projects are just like any other project. Imagine you need to move your data center…you wouldn’t just start unplugging servers and loading them into your car to drive to the new data center, would you? Would you go and spend $20 million to hire a brand new sales team without building a thorough strategic plan for how that sales team will do what they need to do? You wouldn’t hire the people, on-board them and then say ‘start making phone calls’ without planning sales territories, building ‘go to market’ plans and building other tactical plans to outline how the team will execute on your strategy would you? Scratch that…I know some companies that have done that (and they failed miserably). Data projects require just as much strategic thinking and planning as any other type of project. Just because your CEO (or CIO or CMO or …) read an article about machine learning doesn’t mean you should run out and start spending money on machine learning. Most of you are probably nodding along with me. I can hear you thinking “this is common sense….tell me something I don’t know.” But let me tell you…in my experience, it isn’t common sense because I see it happen all the time with my clients. So we agree that if you don’t have a strategy, your data project is going to fail, right? Does that mean if you do the strategic planning process correctly, you’ll be swimming in the deep end of data success in the future? Maybe. Maybe not. The strategic plan isn’t everything. If you were successful because you planned well, then every company that ever hired McKinsey would be #1 in their industry with no hope of ever being surpassed by their competitors. After you’ve spent some time on the strategy of your data project(s), you’ve got to spend time on the execution phase of your project. This is where having the right people, the right systems / technologies in place to ‘do’ the data work comes into play. Again, every one of you is probably nodding right now and thinking something like “sure you need those things!” But this is another area that companies fall down time and time again. They kick off data projects without having the right people analyzing the data and the right people / systems supporting the projects. Take a look at Martin’s “Ten Ways” again, specifically #3. I watched a project get derailed because the VP of IT wouldn’t approve the installation of R Studio and other tools onto each of the team member’s computers. That team spent three weeks waiting to get the necessary tools installed on their machines before they could get started diving into any data. This is an extreme case of course, but things like this happen regularly in my experience. Hiring the best people and building / buying the best systems aren’t enough either. You need to have a good ‘data culture’, meaning you have to have people that understand data, understand how to use data. Additionally, your organization needs to understand the dichotomy of data – it is both important and not important at the same time. Yes data is important and yes data projects are important, but without all the other things combined (people, strategy, systems, process, etc), data is just data. Data is meaningless unless you convert it to information (and then convert it yet again into knowledge). To convert data, you need a company culture that allows people the freedom to ‘convert’ data into information / knowledge. So…you think you have the best strategy, people, systems, process and culture, yes? You think you’ve done everything right and your data projects are set up for success. I hate to tell you, but your data project is going to fail. If you have the right strategy, people, systems, process and culture in place, you aren’t guaranteed success but you will be in a much better position to recover from that failure.